As an animal lover, I know you understand the special connection we have with the pets who share our homes and the work animals whose strength and skills we depend on for our livelihood. These beloved creatures are an integral part of our lives, reminding us daily that the bond between man and beast is undeniable. At American Fondouk, we see the special connection between an owner and their working animals have every day. Their bond is the same bond we have with the pets who share our homes…it’s undeniable. Sfia came to the American Fondouk hospital with a gravely ill foal. … the life and health of her new foal was extremely important to her family’s future. 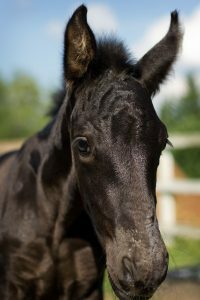 … and, her young son, who had been attached to the foal since its birth, would be devastated if the animal didn’t recover! The animal was born with Neonatal Isoerythrolysis — its mother’s milk contained antibodies that were attacking the foal’s red bloods cells. The three-day old foal had lost around 80% of its red blood cells by the time Sfia could get him to us and was in desperate need of a blood transfusion. 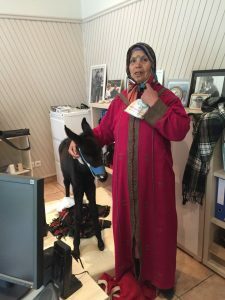 For the four days her foal was treated, Sfia made arrangements to stay near the Fondouk. Each day she visited and watched as over a dozen veterinarians, technicians and students helped her foal recover. Each day, she said prayers, brought bread to the staff and showed her gratitude with two big kisses for everyone. Sfia loves her animals dearly. Each day she shared stories with us of how important they are to her, both for their help and the happy memories they create for her family. Thankfully Sfia’s foal made a miraculous recovery! The foal’s future is bright and her son was especially happy to see his friend return home. Treating Sfia’s foal involved blood transfusions, antibiotics, three days of treatment, food, care and transportation. It’s because of our supporters we were able to help ensure they will all enjoy a healthy future … together! If you’d like to make a gift to the American Fondouk today, please click here. Remember that in Morocco costs are different and every dollar you give is very powerful. Please give the most generous gift you can because every penny helps us save lives! P.S. We checked with Sfia a month after she went home and her foal was doing very well.